I love love love Melody MacDuffee's work! 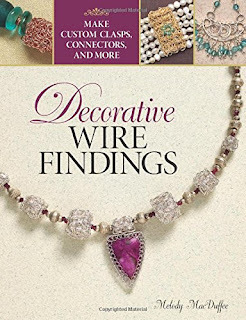 We've seen it before in Lacy Wire Jewelry (my review), and now she has done it again in a brand new Kalmbach book, Decorative Wire Findings. No matter what your style, you can learn to make findings to suit yourself and compliment your work. Do you like color? Tradition? Romance? Gothic edge? 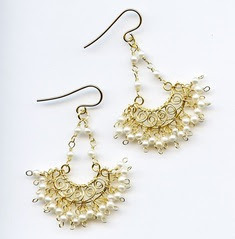 Melody shows you how to take basic designs and, with very few tools, adapt them to make them truly your own. Uniquely, the projects section comes first, covering earrings, bracelets, necklaces, pins, and rings. As you browse through, you will notice the findings and how certain techniques are used in different ways to different effects. And you will drool. A lot. Next comes a very brief materials and tools section, just to make sure that everyone is on the same page. And last come the instructions for the basic techniques (the building blocks), followed by the components used in the many projects. Included are earring wires, headpins, dangles, clasps, other closures, bails, wraps, caps, links, connectors, spacers, bezels, pin backs, and wire beads. Though this may seem a bit backwards at first glance, it's really quite a brilliant arrangement for the book. As you browse the eye candy, each project gives you a list of tools and materials needed, the components you need to make ahead, and the pages where the detailed instructions are found. No time wasted with things that don't interest you!